The winds of Hurricane Katrina, and the national disaster that followed, brought with them a moment of shared cultural awareness: Thousands were killed and many more displaced; promises were made, forgotten, and renewed; the city of New Orleans was engulfed by floodwaters of biblical proportions -- all in a wrenching drama that captured international attention. Yet the passing of that moment has left too many questions. What will become of New Orleans in the months and years to come? What of its people, who fled the city on a rising tide of panic, trading all they knew and loved for a dim hope of shelter and rest? And, ultimately, what do those people and their city mean to America and the world? 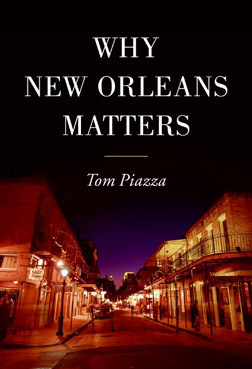 In Why New Orleans Matters, award-winning author and New Orleans resident Tom Piazza illuminates the storied culture and uncertain future of this great and most neglected of American cities. With wisdom and affection, he explores the hidden contours of familiar traditions like Mardi Gras and Jazz Fest, and evokes the sensory rapture of the city that gave us jazz music and Creole cooking. He writes, too, of the city's deep undercurrents of corruption, racism, and injustice, and of how its people endure and transcend those conditions. And, perhaps most important, he asks us all to consider the spirit of this place and all the things it has shared with the world -- grace and beauty, resilience and soul. "That spirit is in terrible jeopardy right now," he writes. "If it dies, something precious and profound will go out of the world forever." Why New Orleans Matters is a gift from one of our most talented writers to the beloved and important city he calls home -- and to a nation to whom that city's survival has been entrusted.